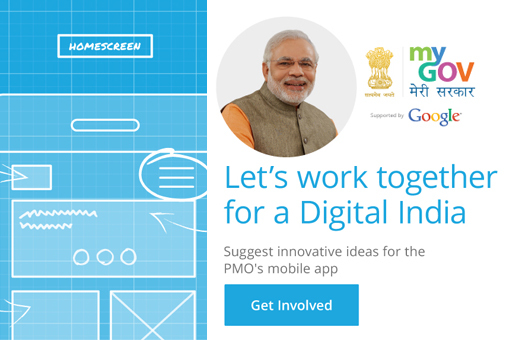 MyGov is organizing a competition (the "Contest") for creation/ development of a Mobile Application ("App")for the Prime Minister’s Office (PMO). The Contest is open for participation to the Citizens of India only. Last Date of Submission for Phase 1 is 23rd March, 2015 by 5:00 PM IST. • Idea Phase (Phase-I): Ideas selected by the jury will win an Android One device from Google and a Certificate of Appreciation from MyGov. • Wireframe development phase (Phase-II): The top 5 shortlisted teams will get Certificate of Appreciation from MyGov and an opportunity to be mentored by Google to build the mobile app. • App Development phase (Phase-III): The winning team will get a Sponsored trip to the Unites States of America to meet a team of Google Developers,subject to Terms and Conditions. Total Submissions (	9275) Approved Submissions (9015) Submissions Under Review (260) Submission Closed. India’s greatest strength is the young who are willing to learn skills and work to improve their economic condition. Lack of employment opportunities for the skilled is its biggest challenge. The PMO App can be the resource to guide and help people to be more economically productive locally within their communities where their living costs, hardships of displacement and commuting is least.